Windows 10 Fall Creators Update and later. In Fall Creators Update, Quick Create expanded to include a virtual machine gallery. While there is a set of images provided by Microsoft and Microsoft partners, the gallery can also list your own images. building virtual machines that are compatible with the gallery. creating a new gallery source. adding your custom gallery source to the gallery. The virtual machine gallery is a graphical view for a set of virtual machine sources defined in the Windows registry. Each virtual machine source is a path (local path or URI) to a JSON file with virtual machines as list items. 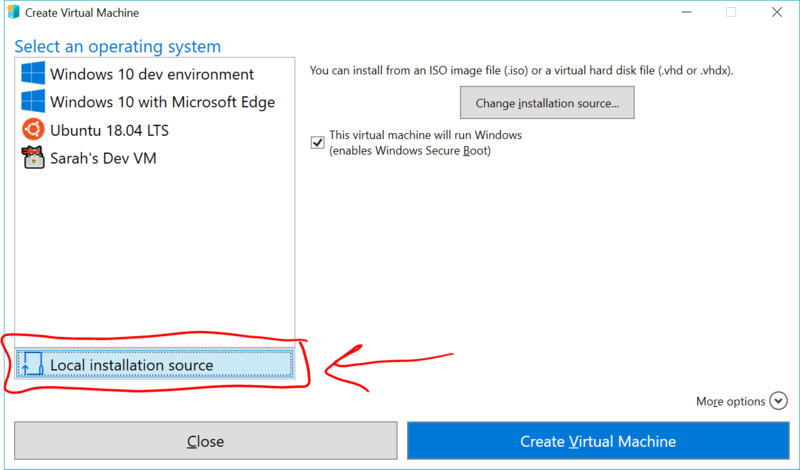 The list of virtual machines you see in the gallery is the full contents of the first source, followed by the contents of the second source, so on and so forth until all of the available virtual machines have been listed. The list is dynamically created every time you launch the gallery. Virtual machines in the gallery can be either a disk image (.iso) or virtual hard drive (.vhdx). Built to support UEFI firmware. If they're created using Hyper-V, that's a Generation 2 VM. The virtual hard drive should be at least 20GB - keep in mind, that's the max size. 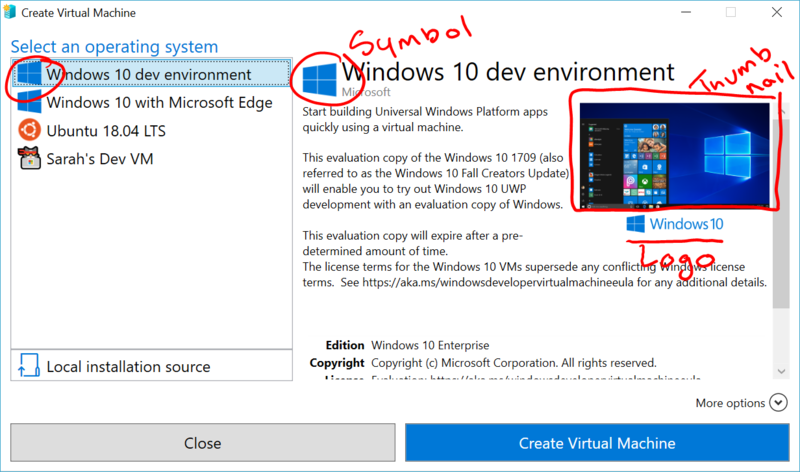 Hyper-V will not take space the VM isn't actively using. 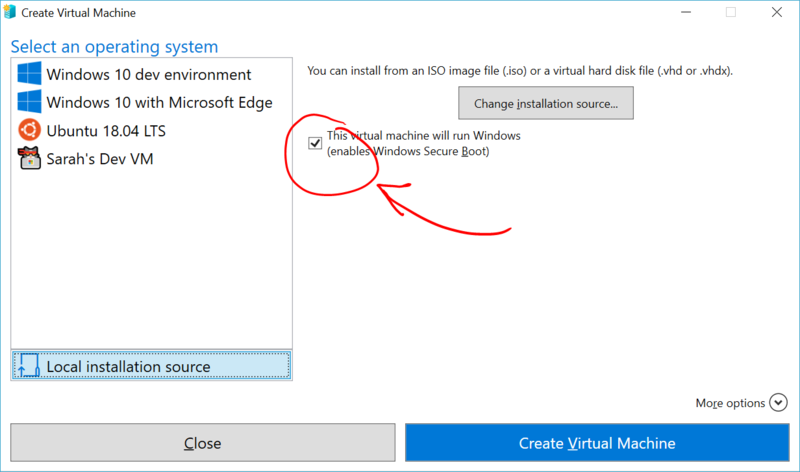 The virtual machine gallery creates virtual machines using the same mechanism as installing from a local installation source. 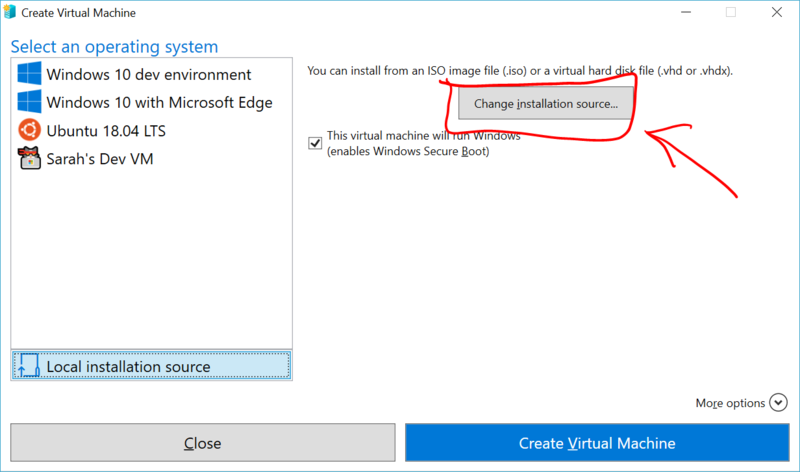 Open the VM Gallery (Hyper-V Quick Create) and select Local Installation Source. Pick the .iso or .vhdx that will be used in the gallery. 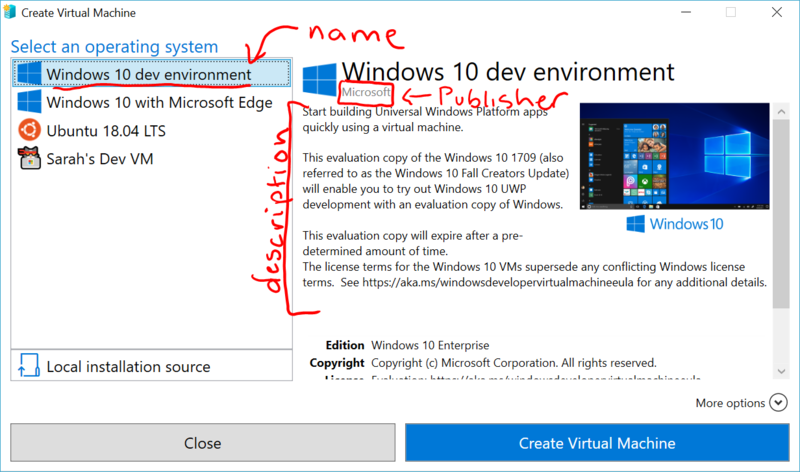 Create Virtual Machine. If the virtual machine boots correctly, it's ready for the gallery. The next step is to create a new gallery source. This is the JSON file that lists your virtual machines and adds all of the extra information you see in the gallery. name - required - this is the name that appears in the left column and also at the top of the virtual machine view. description - required - List of strings that describe the VM. lastUpdated - defaults to Monday, January 1, 0001.
locale - defaults to blank. And, of course, your virtual machine (.iso or .vhdx). The below JSON template has starter items and the gallery's schema. If you edit it in VSCode, it will automatically provide IntelliSense. The easiest way to add your custom gallery source to the VM Gallery is to add it in regedit. If it already exists, go to the Edit menu and modify. 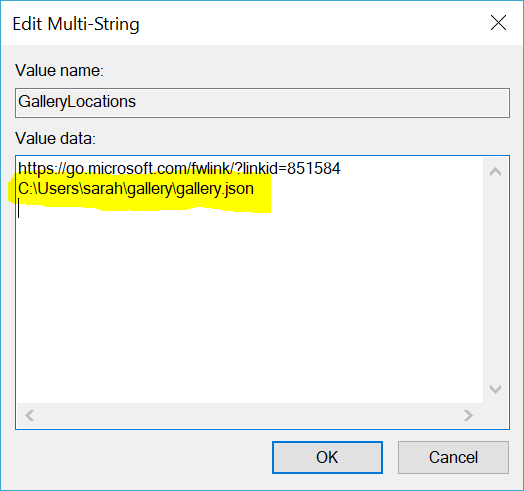 Add your gallery to the GalleryLocations registry key. Look for events from Source VMCreate. There are a handfull of gallery scripts and helpers in GitHub link. See a sample gallery entry here. This is the JSON file that defines the in-box gallery.